There was a hysterical video that went viral a few years ago about sending kids to overnight summer camp. The video mocked a mom for sending her kids away for 7 weeks of summer camp and then spending her days “refreshing” her computer to find pictures of her kid on the camp website. Now I get ready to “refresh” my computer. Click here to watch the hysterical video that sums up the up’s and down’s every parent sending their kid to camp feels. When I searched, for the summer camp video I found another hysterical one about preparing for visiting day. I literally laughed out loud at certain points in the video. Sadly this is because I can relate very closely. Feeling like a I need to bring candy, every item on their shopping lists they send me and also foreshadow anything else they may have forgotten to ask for or else they will think I do not love them, is a real feeling. 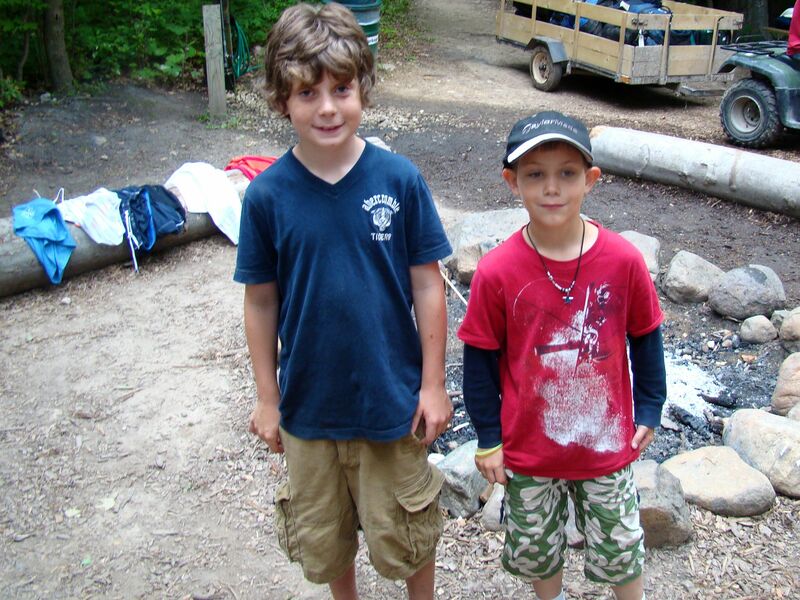 Watch this video on preparing for camp visiting day. My children are about to leave for a full summer of overnight summer camp. As I count down the days a myriad of emotions come over me. The day I made my final camp payment: As I made that final payment, I was overcome with the feeling of happiness. Happiness because I could give my kids this gift. The ability to “unplug” from the pressures of life for a full summer. The gift of independence and resilience. The day I thought more deeply about “the pressures of home”: Then it hit me, one of the pressures they are unplugging from is ME. My next emotion was extreme sadness. How could I allow a full summer of my limited time until they go off to college be spent with out me? 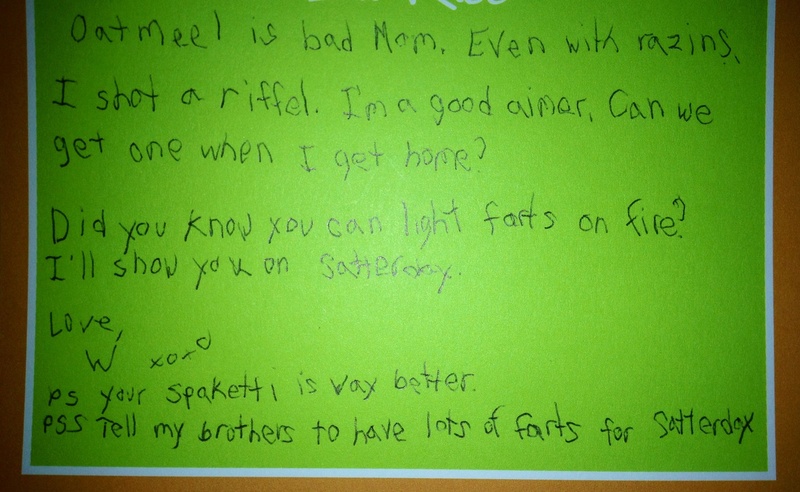 Was I so selfish that I couldn’t create enough fun for them at home? So I offered them the chance to hang out at home all summer with me instead. They responded with outrage because in our town overnight summer camp is a rite of passage and “what are they going to do without all of their friends all summer”? The day I sifted through their baby pictures with reckless abandon. If I could advise my younger self, I would say “make sure you spend as much of the summertime together with your young kids while the kids still want to enjoy their time alone with the family.” I long for the lazy summers where we could all wake up and head out to the beach or pool without a care in the world other than will I be home for nap time or risk skipping the nap and having an uber cranky child? Then I became nostalgic. Looking at baby pictures with reckless abandon. The day I began “extreme purchasing”. This led me to the next phase the phase I like to call, “extreme purchasing”. Somehow I felt better that they would be leaving with airbrushed trinkets and brand new designer clothing. By shopping for them I channelled my guilt into buying their love. The truth is, I know they could care less if their pillowcase is airbrushed or if they have a gift on their bed when they arrive at camp but I couldn’t help myself. Summer camp is almost here. The kids are wrapping up their finals and I am completing the packing process. Everyday a new friend posts their “finished” picture of the camp bags closed with a kid or dog sitting on top of the bags. I too must complete this task for my giant human sized trunks will be picked up in 3 days! As the kids are heading out to summer camp, I need to remind them to get in front of the camp photographer as much as possible. Soon I will spend my day sifting through pictures of all the kids at my kids at camp and “refreshing”. I also pre-addressing the many envelopes that I hope to receive old fashioned letter in. 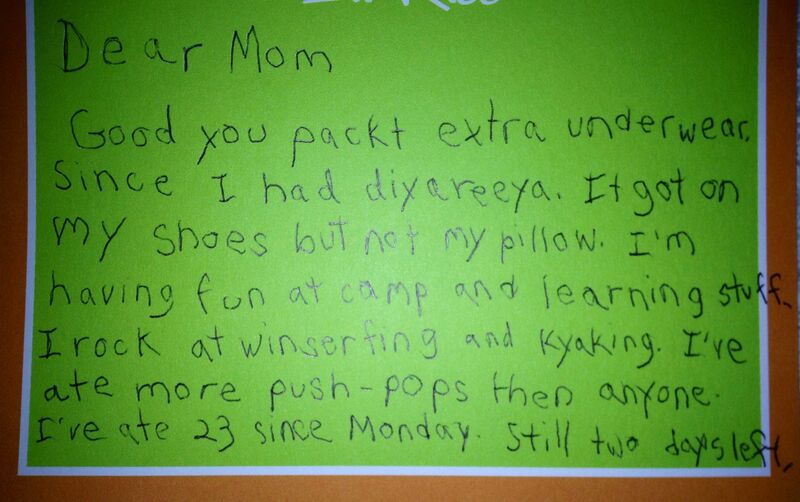 After the “closed camp trunk” facebook and instagram posts, come “the letters from the kids” at camp posts. I’m hoping to get good ones! NBC’s funny segment discusses this here. So off I go to finish my summer camp packing and countdown till camp visiting day. 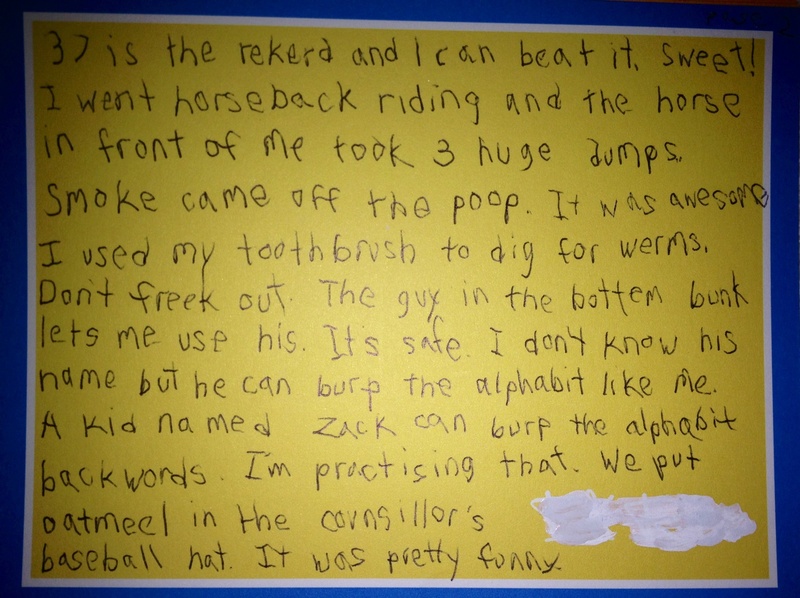 I’ll leave you with this very funny article about letters from camp that I read on Huffington Post. Thank you so much for letting me go to camp. I have learned so many cool things, like how to take a fish off the hook, tie sailing knots, and even how to groom a horse. Thanks for packing the sunscreen. I’ve been out on the lake a lot, so it has really come in handy. You sure think of everything! Since it’s been so hot, I’ve been drinking tons of water! See? I really listen to all your good advice. We are camping under the stars tonight. I hope to see fireflies. This year I’m sending a whole book of stamps. I can’t wait for more letters! This post originally appeared on Hairpin Turns Ahead. Cheers to a great summer. A summer where my kids will be in summer camp and I hope to have time to exercise as often as possible with my 7 day training guide. Simple breathing to reduce stress and calm your mind.